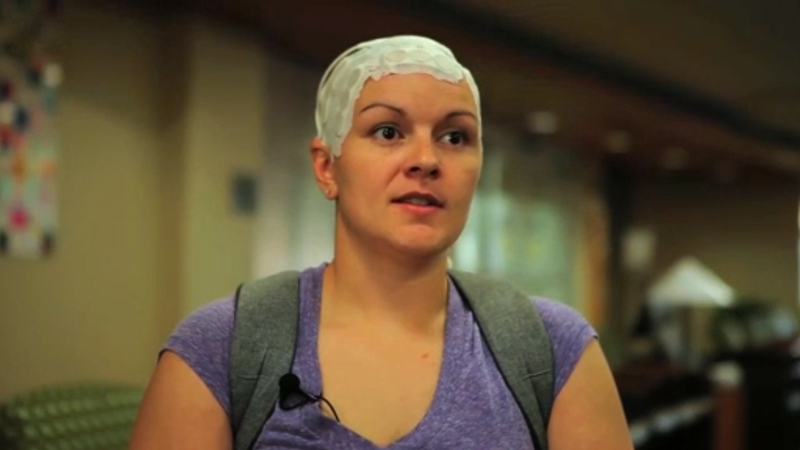 ST. LOUIS MISSOURI – Against all odds, Elizabeth Marek is alive thanks to a tumor-killing device that attacks brain cancer cells with electric fields. Marek has glioblastoma, a deadly and aggressive form of brain cancer with no cure and a life expectancy of just over two years. Twenty-six weeks pregnant with her second child, 3 years after a small tumor was found in her brain, Marek began suffering from extreme headaches. She thought it was migraines due to pregnancy. “It ended up being a tumor that was the size of my fist on the left side of my brain and it was pushing the left brain into the right brain area,” she said. A team of oncologists and surgeons at Washington University in St. Louis, Missouri successfully removed the tumor during an emergency surgery and then waited 8 weeks to allow Marek’s daughter more time in the womb before starting radiation and chemotherapy treatments. After the second round of chemotherapy, a new tumor started forming in Marek’s brain. That is when Dr. George Ansstas offered her a chance to be a science experiment. “I have always wanted to be in science. I didn’t know I was going to be an experiment,” Marek joked. Ansstas fitted Marek with a device called Optune, developed by U.S.-based oncology firm Novocure. A backpack feeds to an array of electrodes attached to Marek’s head. Those electrodes create an electric field inside her brain which stops cell division in cancer cells. “There are highly charged particles in the cells that play a role in division and if you expose those cells to this electromagnetic field you might disrupt that process and lead cells to death,” Ansstas explained. In clinical trials the device, used in combination with conventional treatments, extended patients lives by an average of three months. “Also when we look at those patients at two years about 43 percent of those patients survive, that is something that has not been seen before,” Ansstas added. 43 percent compared to 29 percent with patients that didn’t use the device during the trial period. The results of the trial are being presented this week at the American Society of Clinical Oncology annual meeting in Chicago. The device has been approved by the U.S. Food and Drug Administration (FDA) to treat adult patients with recurrent glioblastoma. More than 2000 patients are currently using the device, according to Novocure. For Marek the results have been dramatic. “The first time I got results back after using it for two weeks, I had a 30 percent reduction in my tumor size,” she said. According to her doctors, Marek currently has no measurable signs of cancer in her brain. She has been wearing the device for a year and says apart from the odd looks, her life is back to normal. “The only thing that is different about me is that I carry around a backpack that is putting electrodes into my brain. That way if little kids say ‘oh what is that for, what is that for’ I say that’s my battery for my brain,” she said.